“But aye wud drave fave hondred males and aye wud drave fave honnnnndred mewer”. You can’t beat a good tune. This weekend sees the PRATS take their longest trip of the season almost 500 mile round trip to Bideford in distant Devon. But not all PRATS are making the journey Pharp and Parker have been detailed to work duties by their respective better halves. Pharp’s got the builders in; apparently they are working on the back passage, there are a few damp patches so they are fitting some new vents. Shame they’re not blocking it up. Although I suspect the potential internal pressure may cause a few issues, we wouldn’t want Pharp to explode, imagine the fall out. Although he does live in Rushden so you might not notice it. There will be a couple of Weebles to keep us company, Marshall and Petit Chemise are driving down on Saturday morning with an overnight stop on the way home. After this weekend the total for the season to date will be just over 2500 miles, that’s like driving to Rome and back. Fuggles and Mrs Fuggles are driving down on Friday via Weston Super Mare for an over-night stop whilst Citra is going by bus stopping in Barnstable on Friday night, then meeting up in Bideford at lunch time prior to the game. 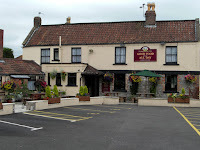 The Fuggles will pop into the Butcombe pub The Woolpack in Worle a few minutes off the M5 jct 21. If you are ever driving down this way, this pub is worth a visit for a drivers rest, decent ales and the food is very good. From here we have a very short drive to Fuggles sister’s abode. In the evening we are planning a trip into Weston and frequent newly refurbished The Imperial. It looks smart and no doubt Mrs Fuggles will want feeding. For Citra there are a few options in Barnstaple, however, not leaving God’s chosen town until 5:30 will limit those options. Even more so as he is kipping for the night on the outskirts of town. In the town are the Bull & Bear and the Reform Inn both looking half-decent. On the outskirts is the Cedars Inn, Wrey Arms, they don’t look overly impressive but may serve as a port in a storm. And so onto Bideford, there is quite a decent choice and some close to the ground, the Appledore Inn is a 3 minute walk away. Yes they sell bloody Doombar but at least we are getting closer to the brewery, just 65 miles away. Lacey's Ale and Cider House, is a bit further away, 4 minute walk, this pub is affectively the Country Life brewery tap. Well worth a visit. There are a few more worth a visit, Rose Salterne, Heavitree Arms Hotel, and the White Hart. See you there. Clotted cream, fruit scones and strawberry jam anyone? LITTLE BIDEFORD TEAR LET ME DOWN.